Golden Globe winner Charlize Theron accepts the grant on behalf of the Film Foundation. The Hollywood Foreign Press Association presented $3.25 million at their annual Grants Banquet held at The Beverly Hilton in Beverly Hills, Calif. The evening was hosted by William H. Macy. Talent who accepted grants on behalf of nonprofit organizations included Alfonso Cuaron, Alfre Woodard, Amber Heard, Ben Hardy, Billy Porter, Charlize Theron, Chris Messina, Christian Slater, Cody Fern, Connie Britton, Cynthia Erivo, Dakota Fanning, Dawn-Lyen Gardner, Jason Bateman, Jason Reitman, Jennifer Garner, Joey King, John Cho, John David Washington, Lena Waithe, MJ Rodriguez, Nia Long, Rami Malek, Regina King, and Steve Carell. HFPA President Meher Tatna welcomed the room expressing the mission of the HFPA. “We will continue to put on special screenings, expert panel discussions, and more to affirm our commitment to recognize the best in film and television from around the world. Steve Carell presented a $250,000 grant to the Refugee and Immigrant Center for Education and Legal Services (RAICES). The Texas-based 501(c)(3) promotes justice by providing free and low-cost legal services to underserved immigrant children, families, and refugees in Central and South Texas. RAICES has been instrumental in the fight to reunite families who were recently separated at the border. 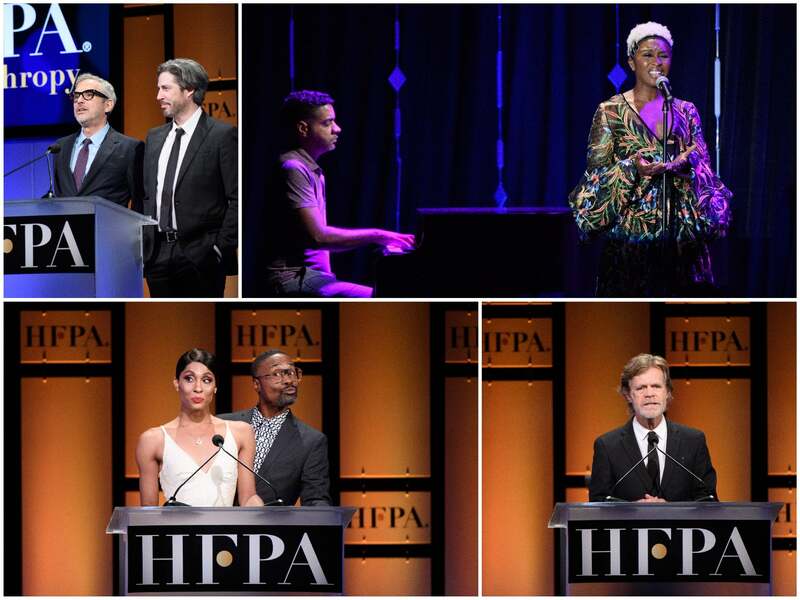 As an organization comprised of primarily immigrants, RAICES’ advocacy and representation for those seeking refuge in the US is one that the HFPA vigorously supports. John Cho, accompanied on stage by Nia Long, accepted a grant on behalf of the Coalition of Asian Pacifics in Entertainment, which offers year-round services to Asian Pacific American entertainment professionals. “As someone born in Seoul, South Korea who lives and works in L.A., I passionately believe that promoting diversity and cross-cultural awareness is more important than ever to ensure fair and interesting storytelling and to give minority filmmakers the opportunity to broaden the audiences’ horizon,” said Cho. Jason Reitman and Alfonso Cuaron took to the stage to announce a recently formed initiative led by the HFPA in partnership with Film Independent. Rising filmmakers from the 2018 Venice International Film Festival and the 2018 Toronto International Film Festival will be selected for a three-week residency program where they will travel to Los Angeles in January for mentorship, master classes, and workshops to help hone their skills. They will attend screenings and education events hosted by Film Independent and attend the HFPA-hosted 76th Annual Golden Globe® Awards viewing party. “Tonight, we are here to do good" - scenes from a night of grant-giving: Alfonso Cuarón and Jason Reitman; Cynthia Erivo brings down the house with "Home"; Pose stars Billy Porter and MJ Rodriguez; host William H. Macy. Grant recipients of the HFPA fall in four major areas: nurturing the development of young artists in film and television through support for scholarships, fellowships and education; preserving the culture and history of motion pictures by supporting film preservation; promoting cultural exchange and understanding through support for major programs and exhibitions that utilize film to ignite critical dialogue; and supporting special projects, educational and cultural activities connected with the entertainment industry. The HFPA began giving grants as early as 1989 to institutions such as University of California, Los Angeles (UCLA), University of Southern California (USC) and the American Cinematheque, which continue to receive support today. The HFPA has created endowments at Los Angeles colleges and universities to help underserved students such as Los Angeles Community College and California State University, Northridge. For more than 25 years, the Hollywood Foreign Press Association has donated over $33 million to entertainment-related charities, scholarship programs, and humanitarian efforts. Licensing fees obtained from the Awards show has allowed the HFPA to support over 80 nonprofits focused on education in film and television, film preservation, journalistic organizations committed to freedom of speech, as well as organizations that support natural disaster relief and other international and humanitarian crises such as the International Rescue Committee (IRC), FilmAid International, The Kailash Satyarthi Children’s Foundation, and Refugee and Immigrant Center for Education and Legal Services (RAICES).